The UFC has not taken their talents back to Minneapolis since UFC 87 in August of 2008, so the Octagon is long overdue for a comeback. 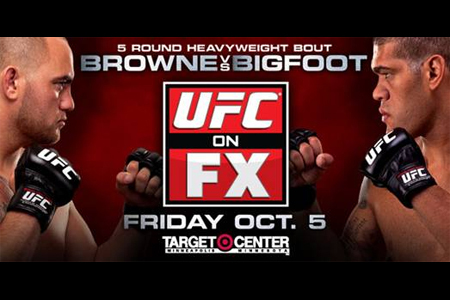 Thankfully for fight fans located in T-Wolves country, “UFC on FX: Browne vs. Bigfoot” will end the drought on October 5th. Target Center in Minneapolis will host the festivities. Four fights will appear in the main card, which FX will be broadcasting live beginning at 9PM PET/6PM PT. A five-round heavyweight affair between Travis Browne and Antonio “Bigfoot” Silva headlines the show. A 265-pound bout with Matt Mitrione and Rob Broughton serves as the night’s co-featured attraction.